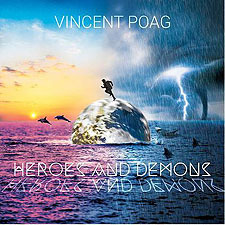 The ten track album is Poag’s third studio recording - Circling Back (2011), For The Girls (2014) - and, in much the same vein as all of those, Poag once again draws lyrical inspiration from everyday occurrences and thought-provoking subjects. The playful, Renaissance-esque 'Piper Play' is up next and is followed by the piano-led ballad 'Here I Am.' Featuring Diana Hope on vocals, it's out of nowhere here, as a "Poag track," but is as beautiful a cut as there ever was. That's backed by the jangly guitar work of 'Young Again,' before the pace is brought down somewhat for some more delightful storytelling within 'Too Much Of Nothin' To Do' ("... fine is the line between living and dying"). Old time radio comes to the fore with the playful, aristocratically-defined 'Sir Nicholas Winton,' and that is backed by the delightful ode to 'Daisy,' with the album coming to a close with the war-infused trooper recollection of 'And The Ocean Rolls.